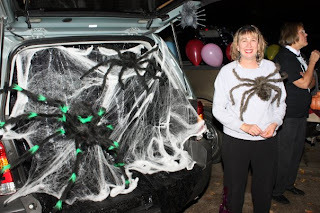 Trunk or Treat - A growing Trend. 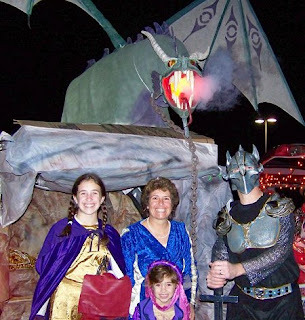 I ask you this...what happened to the days when you got home from school, put on your costume that you (or your mom) worked so hard on and ran out the front door to meet your best friends to go Trick or Treating? I remember staying out until the street lights came on. We would run up and down the streets kicking through the leaves with our candy sacks while looking for the next house we would say "Trick or Treat" at. It was one of the best nights of the year to be a kid and now times or I should say traditions seem to be changing for Halloween. Kids today and their parents seem to enjoy the door to door Halloween adventure less and less and perhaps it is because of a new tradition that is growing ever popular, a tradition that makes it easier or more convenient for our little tot's and their parents. These days some parents feel it's not safe to let their kids go walking door to door. They don't know all their neighbors or trust what kind of treats are being handed out by the ones they are not all to familiar with. Because of this a new trend has begun to pick up these past few years. 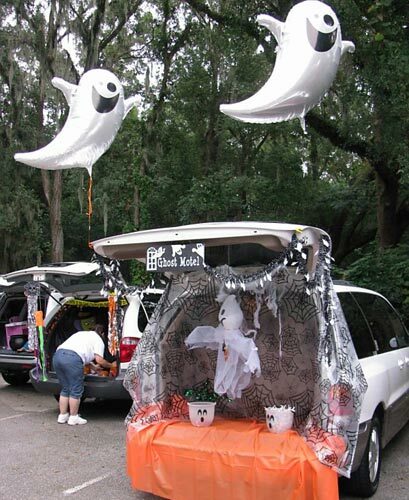 A trend that seems to be a threat to our classic way of trick or treating and it's called Trunk or Treat! Trunk or Treat is a Halloween event that is often conducted by your local church or school. People gather and park their cars in a large parking lot. They open their trunks or backs of their vehicles and decorate them. Once decorated they pass out candy from their trunks to the parade of little trick or treaters thus providing a safe family environment for all to experience. If you ask me handing out treats from the back of your car sounds just as creepy as going door to door maybe even worse but I suppose it's the idea of doing it in a safe environment in daylight hours that makes this the type of Halloween experience most parents today want for their youngsters but I can assure you that with a ToT of my own on the way I will be kicking it old school going door to door in classic Halloween Style! Maybe my tune will changes in the years to come but for now home is where the haunt and Halloween is and should remain. Now I am not knocking Trunk or Treating...actually I applaud the efforts of some trunk or treaters as a few could be deemed mini haunters. As a matter of fact it's almost an entirely new style of haunting in and of itself. Before I wrote this post I decided I should really give Trunk or Treating a chance and look it up just to see if anyone was taking the decorating part to the extreme because lets face it...if your just opening your 67' Chevys rust old trunk and handing out candy that's just pretty weird and ummmm lame! So what did I find?? Well there are actually a few websites dedicated to Trunk or Treating and people do actually get pretty creative with it so here is a quick inside look at what some of these Trunk or Treat Haunters are doing to haunt our their cars. First I'll take you to the website I came across when I first started to research this new trend. The site is called Trunkortreat.homestead. This site provides the perfect explanation of Trunk or Treating. They go over almost every detail of it down to the actual decoration of the vehicles and they even provide a nice size photo album dating back to 2006 so Trunk or Treating has actually been around a bit longer than I had even known. As a matter of fact I believe this was the first year I ever heard of it and actually finally saw it in action at two local schools I live near. It was nice to see all the kids dressed up in their costumes of choice and there even a few who looked to have made their own costumes. Now I didn't see many cars decorated to the extent of the ones you can find on the TrunkorTreat website but overall I could tell that the spirit of Halloween was still there, maybe not in the way that I know or love but it was present. I will always be a home haunter at heart decorating my house with ghoulish tricks and treats for all who dare to come ring my bell and hope that this new trend can coincide with our classic way of doing things but with a ToT of my own on the way I begin to to wonder if a future of Trunk or Treating will one day be upon me? If it is let it be known now that Frightguy will be pulling all the stops but for now, at least for a little while, my feet are securely planted in the ground as a home haunter fighting to keep Halloween the way I have always known it to be..an adventure! 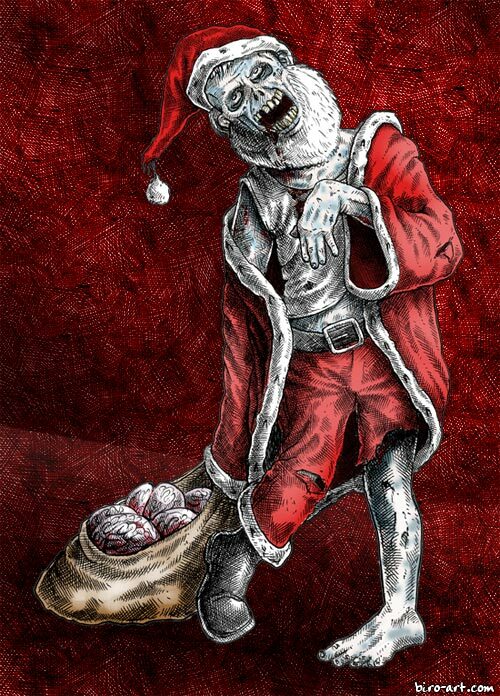 Tis the season for haunt savings fa lalalala la la la laaaaaa! 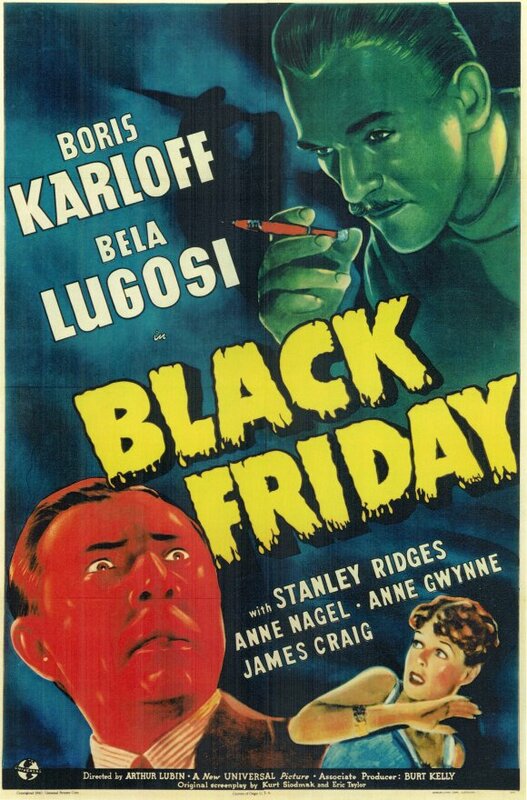 Just a heads up that Black Friday is here and that doesn't just mean crazy savings on home electronics and more at your local stores but it also means some nice savings on Halloween goods from some top vendors in the business. 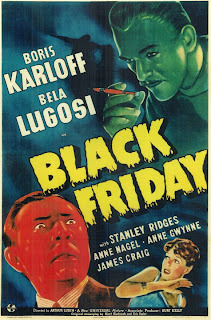 Prices on top quality props, motors and effects usually inflate the closer we move towards Halloween but after Halloween has come and gone a lot of vendors are looking to push overstock items out the door to make room for new inventory so you have to keep your eyes peeled on their websites for some great deal. 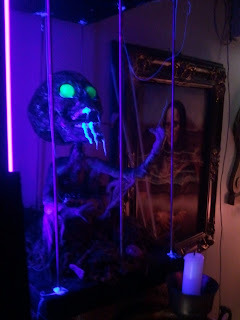 Sometimes those prop controllers, 3 Axis skulls or even the little extra detail props that would look good in your cabinet of curiosity all go on sale for bargain prices that are even sometimes less than what we would normally see them being at a haunt trade show so start looking around on your favorite haunt vendors websites to see what (if any) deals you may be able to score. Even if a percent off has not been listed prices may still be slashed a bit. 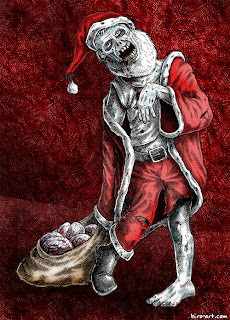 Here are a few of my favorite vendors to frequent that do have a few deals going on so take a look and get a head start on next years haunt while the getting is good!! Very short post tonight but the title says it all. 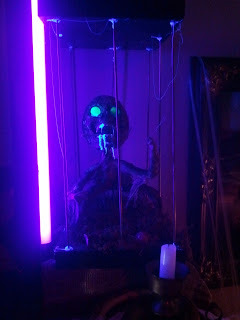 Something wicked is brewing here in the dungeon of Grimlock Manor for what could be a very interesting 2012 for us. Do you dare to guess what it is??? So I decided to break down my haunt video for 2011 and start some prop focus videos. I will be posting picture slide shows of some of my favorite new props from this year, how they came to be and the process of them coming together. The first is my Madame Leota spirit ball. This was the hit of the show this year and really was a last minute decision but one that I am happy I did. 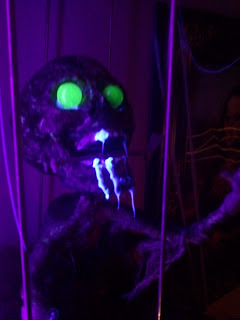 I have seen this prop created and have watched videos of various set ups with it on youtube but never thought of doing my own until I watched a how-to by Mr. Chicken and Shellhawk to favorite haunters of mine! They did a great step by step and gave me the confidence that I could do one of my own and well below is the proof that it can be done! I found this to be a fun first step into the world of projection effects and one that I am eager to continue on with next year. I highly suggest to anyone who hasn't tried doing one of these to take a stab at it. It is instantly gratifying and really effective. 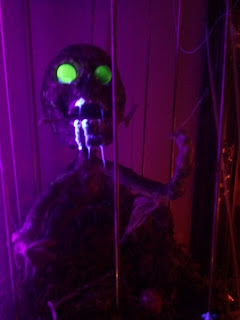 People just seemed to gravitate to this and really loved it which I am glad they did so please enjoy the video below and if you have any questions or comments please post them and don't forget to watch the full Grimlock Manor 2011 haunt video right below this post. More prop focus videos coming in the following day. Next up is the Mini Minion which was one of my most favorite build this year! 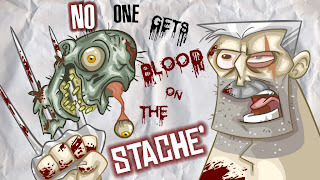 Well the wait is over, we have our first official video for Grimlock Manor 2011! We really have been procrastinating for way to long so we finally sat down tonight to edit this together. I think I would have liked to have given some more time to the editing but seeing how I am off to a wedding tomorrow and will be away for most of the weekend and the fact that I am aiming to enter into the 2011 Home Haunt of the Year contest who's deadline is November 20th at 12PM EST I figured lets just get it done! 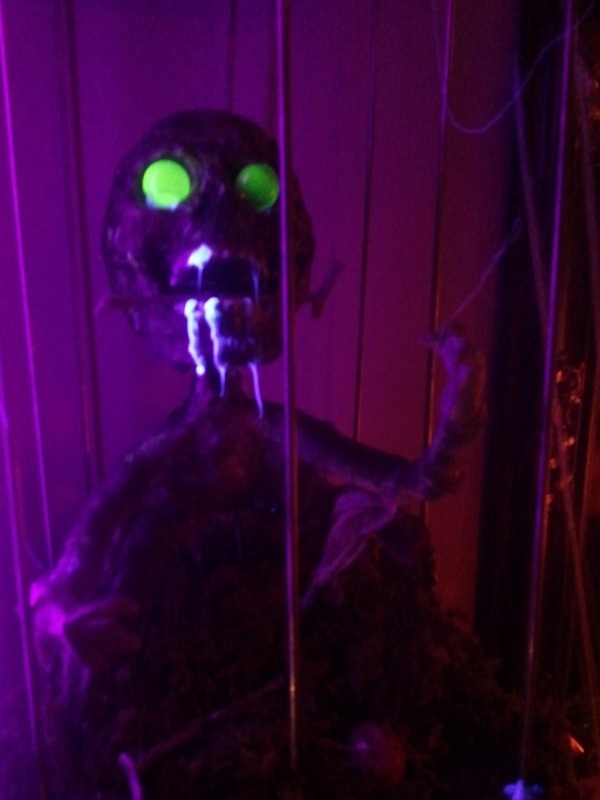 I am pretty happy with what we did this year for the haunt and for the video. We had a ton of pictures and video to sift through which is kind of the reason why I have been putting doing the video aside...I just didn't want to go through it all cut, splice, and add music but in the end it's not too bad. A lot didn't make it in..we actually had an entire carnival section which we haven't shown here but next week we will do a full picture slide show video of everything because we have build pictures, day time pictures, and night time pictures. 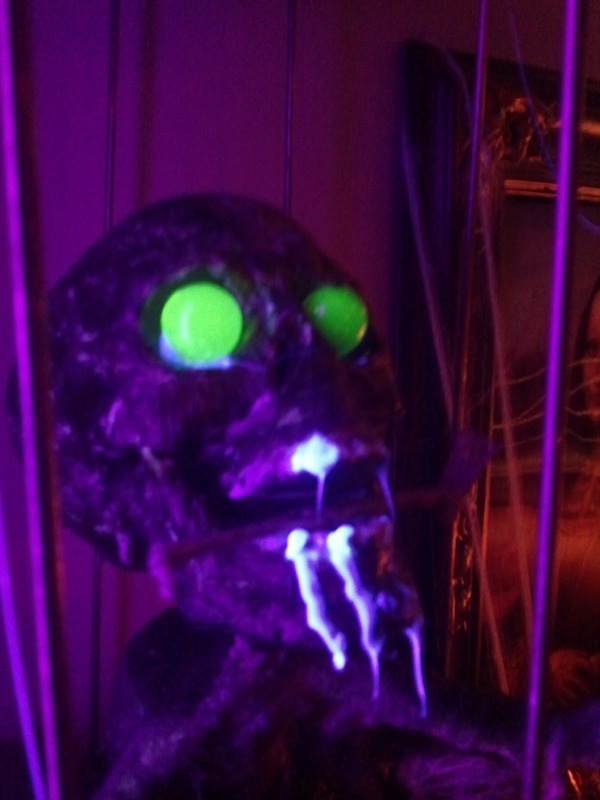 I would also like to do a few focus videos on some of our props alone such as the Mini Minion & Madame Leota. I think there is plenty that we looked at this year and said we could have done better or we could have done certain things differently but overall I liked the variety of what we had. Next year I want to tidy some things up and I am looking to add more projection effects (maybe a quartet of singing busts?) I am also setting forth to build my first ever 3 axis skull but I won't be alone in my venture as my good friend Ghoulishcop from the Devils Eve blog will be joining me as we both build a 3 axis skull together. 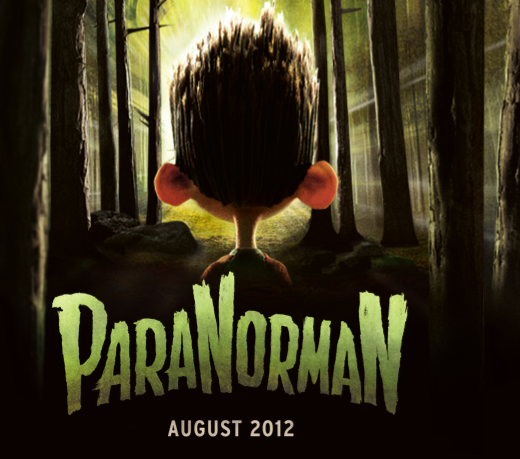 I have never really had a "Haunt Greeter" so that will be my intention with this and I am really looking forward to it! Well I hope you enjoy the video. If you have any questions please feel free to ask, leave comments and I will do my best to answer. 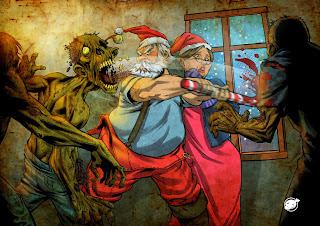 I hope you enjoy Grimlock Manor 2011 and I am looking forward to 2012!! 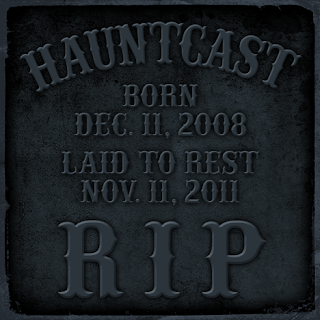 If you haven't heard the latest and final Hauntcast be sure you check it out. Most of my goodbyes are on my final segment of Access Hollyween but again I want to say here on my blog that it has been a pleasure to have the opportunity to work with the Scream Team and also connect with some great fans of the show. Though my time as a Scream Team member was short I walked away with some great friends and an awesome experience. I learned a lot not only about radio and what it really took to put together such an outstanding show but about what it really meant to be a Halloween fanatic. 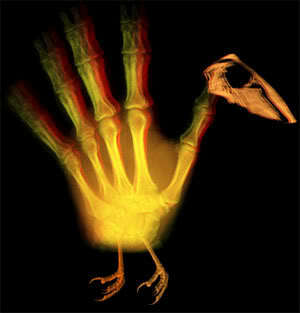 We do this because we love not only the Halloween Holiday but this community. Haunters are some of the best people I have ever know. I have made so many genuine friends through haunting. Some of the nicest and most generous people. Most of you I have met at conventions here and there, some I know from my own area and local Make and Take and others I have only had the pleasure of exchanging emails from time to time with but without a question my general feelings are haunters are the best and this community we have is one I am greatful to be a part of. 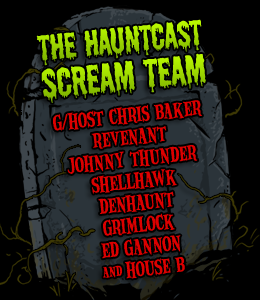 Hauntcast did help me open up some doors to new friendships within our community and it gave me another avenue to connect with you all and that is something I appreciate very much. Anyone who knows me personally knows I really love Halloween and haunting, I live and breath Halloween every day and any opportunity to share my passion with other like minded hauntaholics is one I cherish. I can't predict if Hauntcast will stay in an eternal state of slumber from here on out but I can say that I will try to continue to provide "Edutainment" much like Chris always said was what Hauntcast tried to do. My blog has been an outlet for me to share my passion for Halloween and I will continue to strive to make it both entertaining and informative. 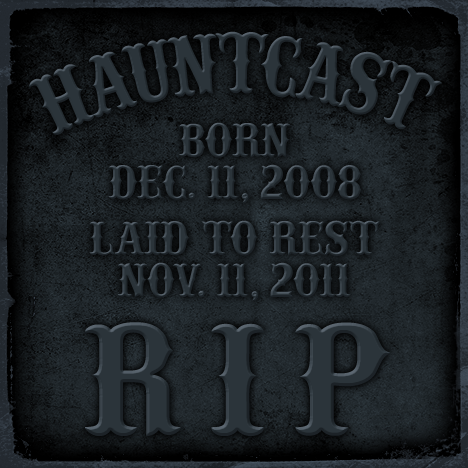 I have some new projects and ideas in mind for the future of this blog as well as other media formats I would like to branch out to and take a stab at so please stay tuned for some future updates on all that but for now I tip my hat to Hauntcast and everyone who made it what it was which was the number one radio show for haunters and halloween fanatics! Heres to my haunted family, cheers and stay scary! So this weekend the wife and I are head back to Elaines Bed & Breakfast in Cape May. 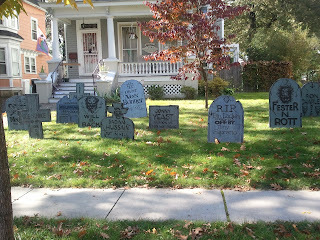 As per the book "Cape May Haunts." Elaine's is considered one of the more haunted locations in Cape May. 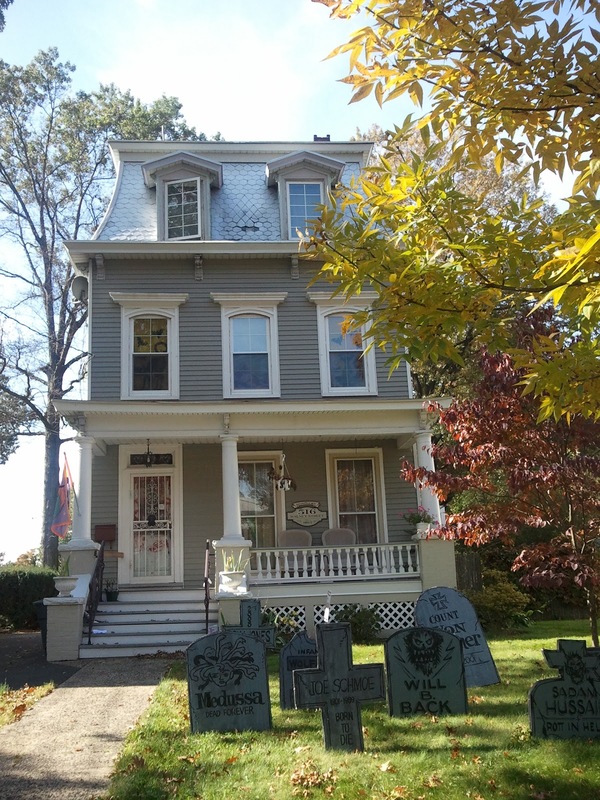 Cape May itself has a very haunted past and most of the Bed and Breakfast's, Hotels and other various landmarks all have their very own chilling tales but having experienced a number of head scratching event's while on past stays at Elaine's I tend to believe there is something paranormal going on there. 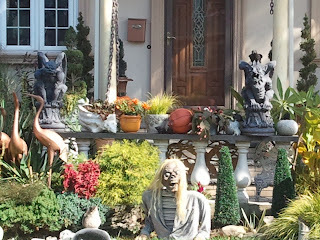 Being a haunter I consider Cape May a great spot to travel to in NJ for haunt inspiration. The victorian era homes, the old cobblestone pathways and storefronts and village atmosphere conjures up many spooky images in my mind not to mention the many Ghost Hunting excursions they offer. 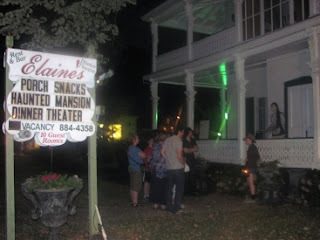 Even Elaine's has their very own Haunted Mansion Dinner experience which I have attended. They put on a great show which is full of special effects, animatronics and live actors. It's a lively or in this case spirited experience! 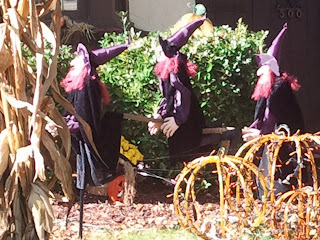 I'm looking forward to another stay at Elaine's and Cape May and will post about my adventure as soon as we get back. Until then stay frightful! Well I am still going through all my pictures and video of the haunt this year and yes I really took that many! In the past I always fell short of having a lot of pictures and videos to look back on and I wanted to be sure I got everything this year... the down side is its hard to figure out which ones to pic and how to edit it all together into my haunt video this year but what I decided to do tonight is post some pictures from what I saw around town this year as well as post some links to fellow haunters that live close by me who's haunts are definitely worth going to see. I will start with a few pictures. The pictures below all belong to homes in Roselle Park NJ. 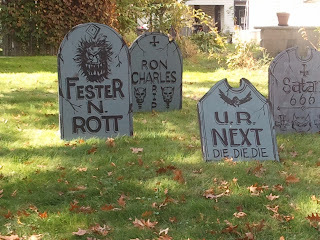 This is a great Halloween town to live in and where I hope to own a home shortly! 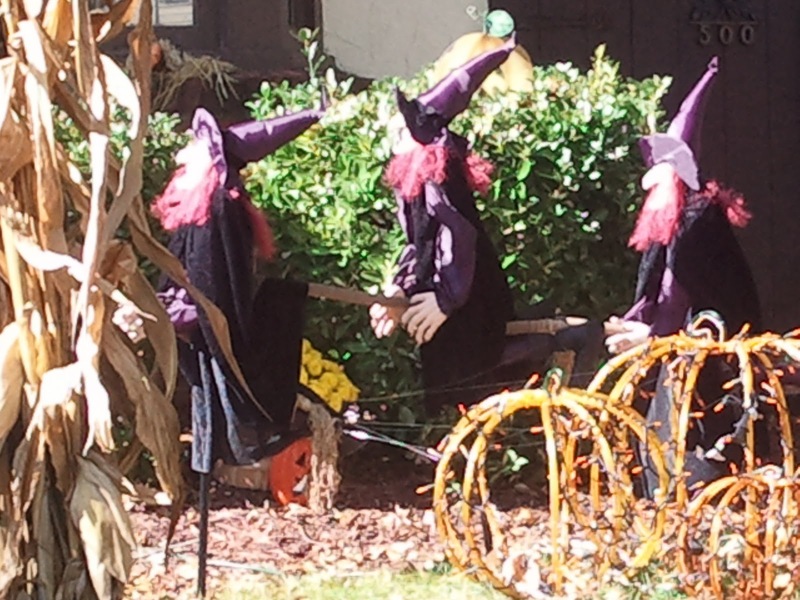 The town actually holds a town wide decorating contest and urges the residents to get into the Halloween Spirit and you can tell by these few pictures that they really do get into it which is nice to see. 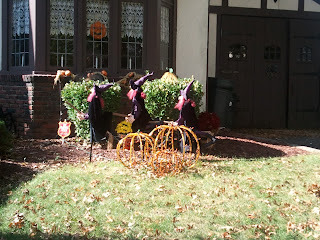 To explain a little more about Roselle Park NJ, it's where my wife grew up. It's a great mix of people and kids of all ages and every Halloween the streets are packed with Tot's. The most famous street notorious for it's off the wall home haunt displays is Bender Avenue. 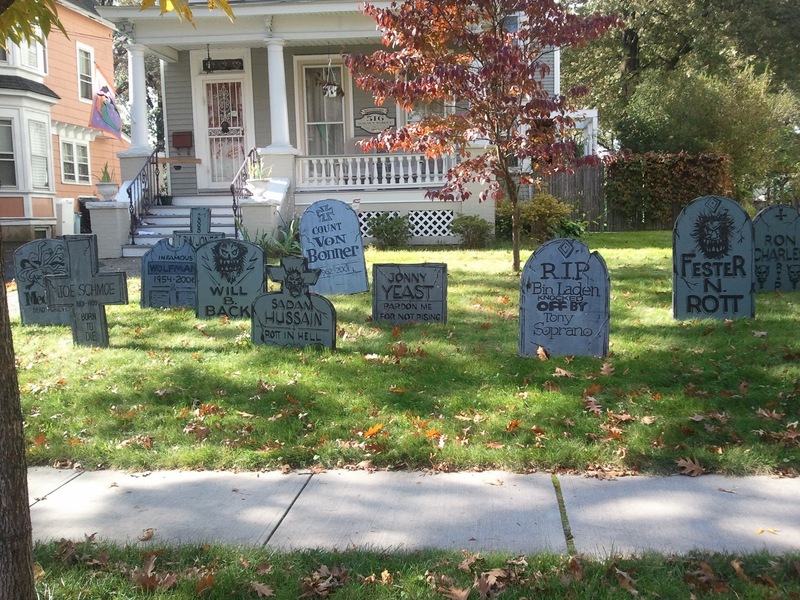 They normally block off Bender and hundreds of Tot's along with their parents go dressed up to the block to Trick or Treat and to show off their costumes. It's almost like a mini parade just without the floats and all that jazz. 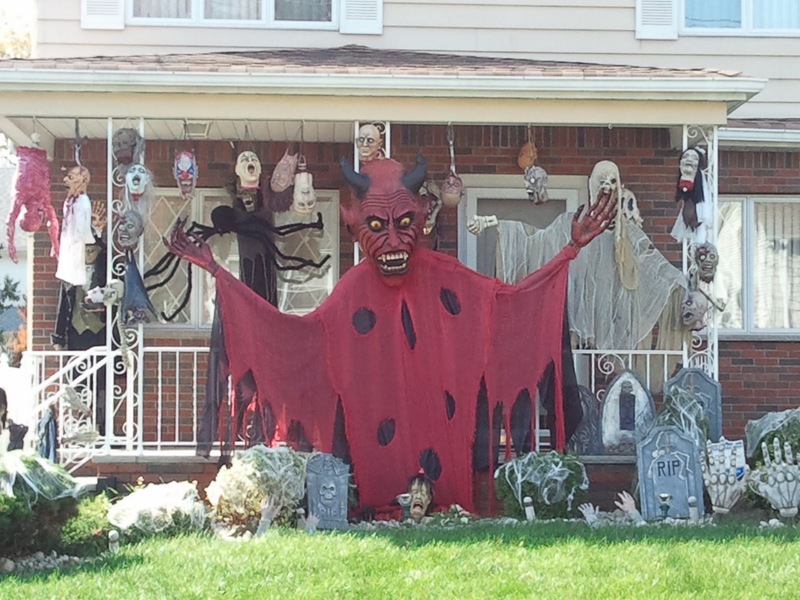 All of them were neat in their own way but I really liked the witch silos as well as the over sided Devil in the last picture. The witch silos gave me some cool future prop ideas for Grimlock Manor. It's funny how simple they are to create and what a dramatic effect they have. 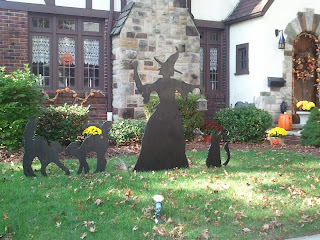 I didn't really have the opportunity to go back to any of these at night as Halloween ended up being postponed in the town until November 5th due to the snow storm most of NJ experienced but I hear by Halloween much more was added to these displays and with their lighting at night they looked even better. 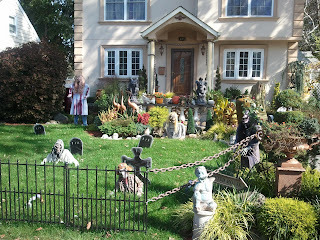 On Halloween I actually traveled to my friend Sharon's haunt Bloodcrest Manor. You may know Sharon as Joiseygal which is her haunt handle. 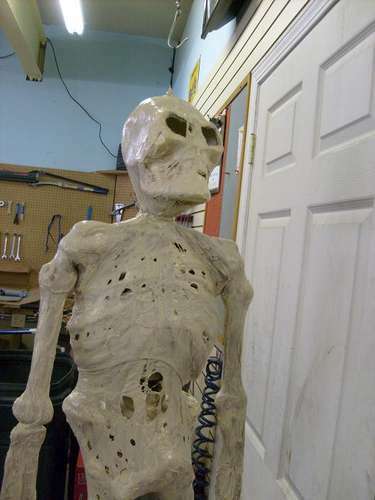 Sharon also does weekly vlogs on YouTube in which she details her on going prop builds and all that is going on with her haunt. 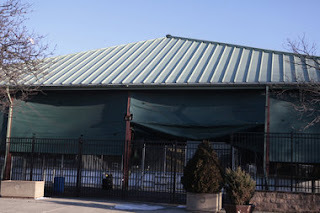 I had never been to Joisey's haunt in person and only have ever seen pictures and videos so it was a real treat to be there live in person to see it in all it's spookyness! Joisey is one of the many haunters who has taken her display to the extreme by adding a walkthrough to it which I can say from experience is a daunting task that requires a lot of hard work and time but she really uses that time wisely to set up one heck of a haunt. 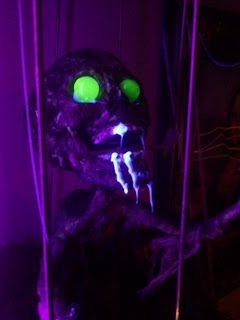 Joisey not only had a lot of tricks up her sleeve with some cool special fx props but you can tell she has experience in how to set up a great scare. Joisey has been working as an actor at various pro haunts for the past two years (maybe more?) The experience she has gained through the pro haunts really shows up in her haunt as you wind your way through various scene set ups that all cater to different fears. She misleads your senses and does a great job to disorient you in order to shock you at the very last moment and I have to confess she made me jump a few times! If you ever have a chance to see Bloodcrest Manor in person then I suggest going. 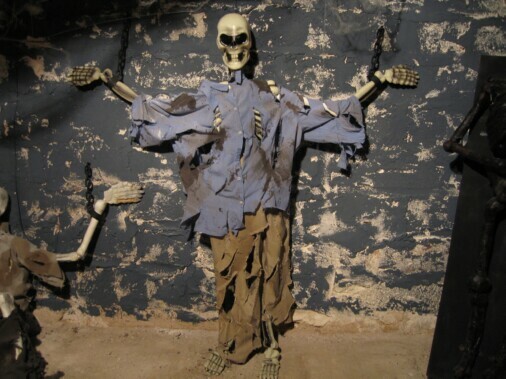 This is one Home Haunt that continues to grow and deserves some attention. 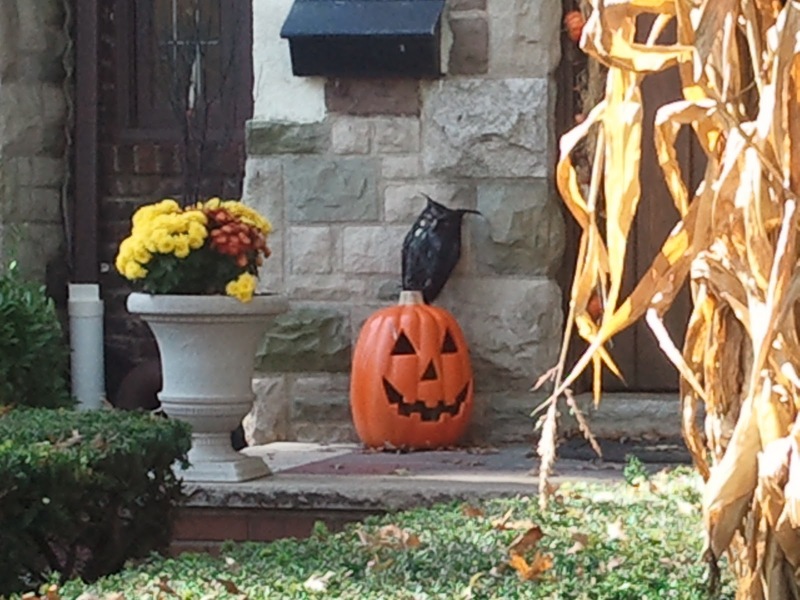 I for one plan to add a trip to Bloodcrest Manor to my to do list for Halloween from here on out. Here is a quick day time walkthrough and keep your eye posted on Joiseys YouTube channel for future updates. 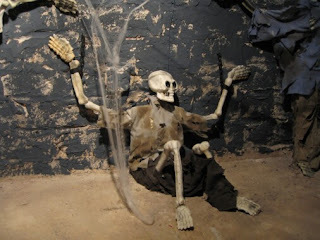 To wrap up this post I have one final haunt which is only 5 minutes from my house and until this year I never knew existed which is one thing I love about being a home haunter, each and every year you seem to find a new haunter to get to know and there is nothing better then finding out that their is someone who shares your same passion as a haunter and Halloween fanatic and they live only a stones throw away! 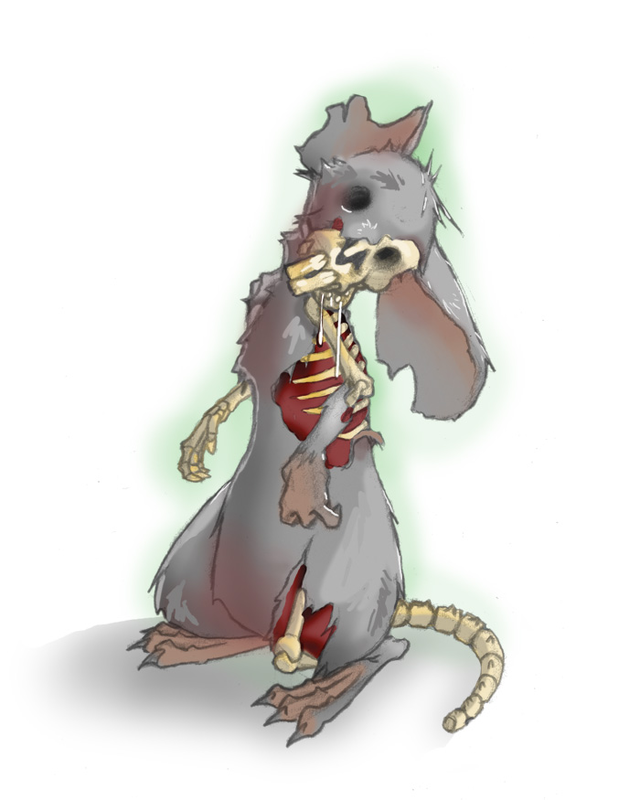 I came across Pandemic Cemetery which is run by Dr. Death AKA Dave this past summer as I received an email from his wife who I actually went to High School with! Small world huh?! Mrs & Mrs Death actually came to Grimlock Manor in our first year and finally followed the paper trail to myself a few years later. We have begun to talk and I look forward to meeting up with them soon and learning more about Pandemics past and future and though I couldn't make it to see their display this year Dr. Death has created a great video of his haunt this year which you can view on his YouTube Channel which I highly suggest checking out because Dr. Death himself actually posts videos quite often on all the props he is working on and the process of putting them all together. It's a nice behind the scenes look. 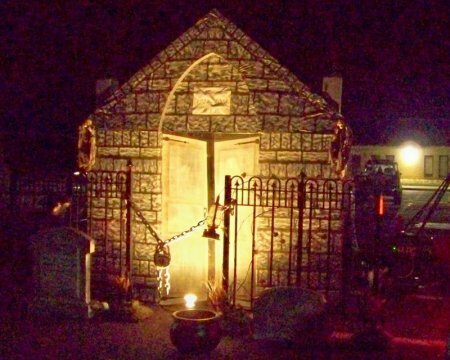 I will leave you with the Pandemic Cemetery 2011 video below which again is amazing stuff and overall it was a fun Halloween season in which I got to see some great haunts that have inspired so many new ideas. 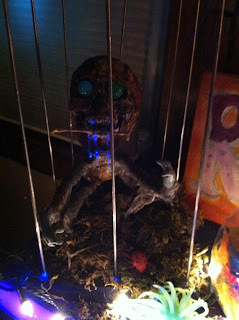 I can't wait to get started on Grimlock Manor 2012 and look forward to seeing what new haunt gems I find next year. Happy Sunday! 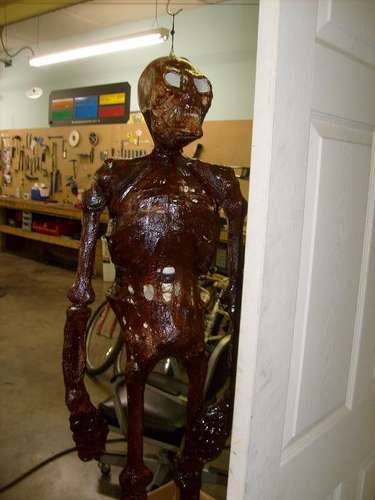 It's a beautiful day here in NJ and I am eager to get outside and stretch my legs for a bit because they are feeling a bit creeky like a skeletons which makes me think about the 2 Blucky Skeletons I have sitting in my truck right now. 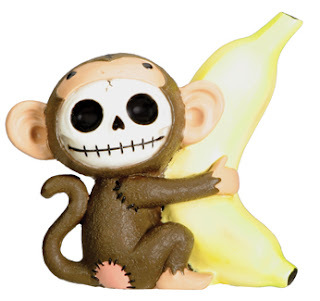 Last week I went to Spirit Halloween on it's last day and found everything to be %50 off! I immediately felt like a kid in a candy store as I began to rummage through what was left in the large New York City based Spirit store. Many things caught my eye but then I came across the Blucky Skeletons. 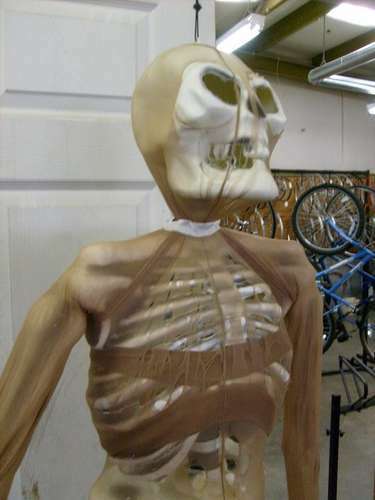 Now I know a few readers of my blog may not now what a Blucky Skeleton is but its those inexpensive blow molded skeletons you seem to find in about every store during Halloween. They usually are around $20 and are a nice way to add a full sized prop at a budget price to your cemetery scene for Halloween. Heres a picture of one right below..
Now as funny as it seems I have never purchased a Blucky. I know, I know..shame on me. It seems like a prop that every home haunters should have in their arsenal but I always sat their while in the store saying to myself "do I really want one of these?" "They look pretty cheesy.." But the fact is Blucky's really are versatile if you give them a chance so this time while I was in Spirit Halloween with %50 off signs spinning in my eyes I told myself how could I pass on two Blucky Skeletons when I am basically getting one for free so I grabbed them up and headed home with them! For Halloween 2012 I really want to add some standing props in the graveyard. 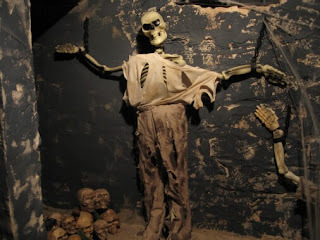 I have only ever had my Caretaker, his boney dog pal and a large Grim Reaper but in 2012 I would love to have some corpsed skeletons that appear to be walking towards the tot's with their arms outstretched and these Bluckys give me the perfect opportunity to do that. I have begun to check online for various props that have been made from Bluckys along with corpsing techniques and even motorized applications that have been added to them and to my surprise (though I shouldn't really be surprised at this point) I found quite a few good sources three of which I would like to share with you. The first source is from Spookylake.com They provide a nice tutorial on how they corpse their Blucky Skeletons. Here is a quick list from their site of what they use for the process.. The tutorial on the site is very detailed as they break down each body part and how they treat it with the materials. They provide just around 15 pictures of the process so you can see what each step looks like and they end result looks pretty darn good. It's just one take on how you can take this inexpensive prop and elevate it to new scary heights. The second source is from the website Instructables.com I really like this website and there is actually quite a few great Halloween How To's on it if you do some quick searches. This particular tutorial was for how to corpse a Blucky and again it gave a nice step by step break down with some great pictures, three of which you can see below.. The last site really reminded me about what I said originally about these Blucky's being a versatile budget prop. The website is Cindybob.com and they show you how to add simple Animation to your Blucky by using some simple and inexpensive servos from Servocity.com They used these servos to add slight head movements to three distressed prisoners in a dungeon scene which you can see below. I think they came out great and it goes to show you what a little ingenuity can do. I am not 100% sure what the future of my two Blucky's will be but a complete overhall of them seems to be on the horizon. 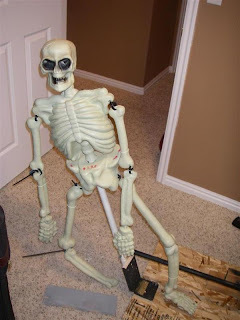 So to sum this post up I guess I can say the moral of the story is don't leave a good Blucky behind because they can provide a real scare to your haunt this upcoming Halloween season if a little TLC is given to them. Well even though Halloween has now officially come and gone I am still re-living every moment of it as I currently sift through all of my videos and pictures of our set up for Grimlock Manor this year. 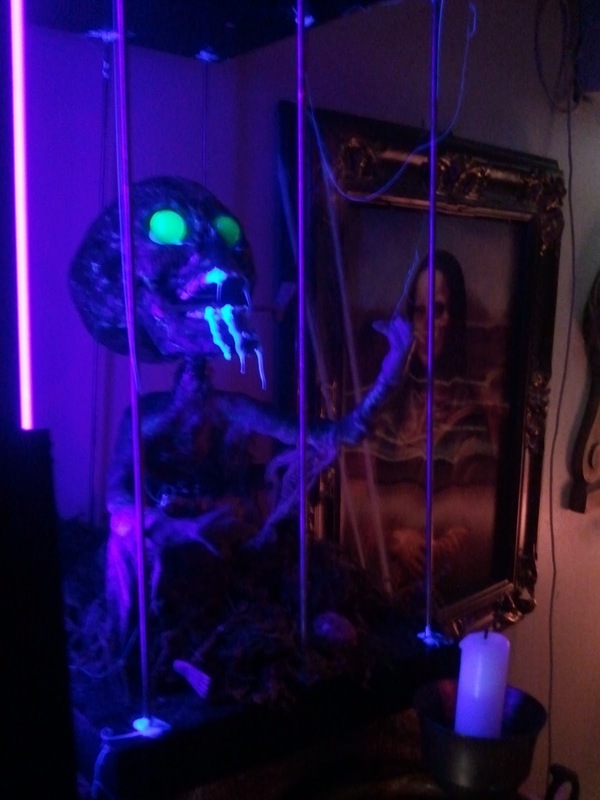 It's about that time to create my haunt video for this year which has become a common practice among haunters as a means of sharing with each other and showing off our displays. You can often find these videos on youtube by searching for "Home Haunts" or even "Haunted House's" or you can head to forums such as Hauntforum.com or Halloweenforum.com to see videos and or pictures of haunts from all across the nation. 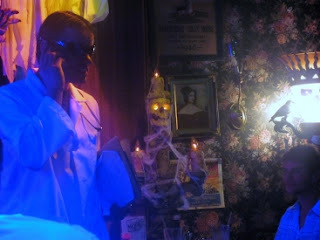 Not only do our videos and pictures become our own personal diaries but they are also used to enter many of the online contest that are provided to us haunters in which some of the most respected and well know haunters both pro and home vote on them and crown winners in categories such as Home Haunt of the Year, Best Static Prop, Best Video Production and Propmaster awards just to name a few. 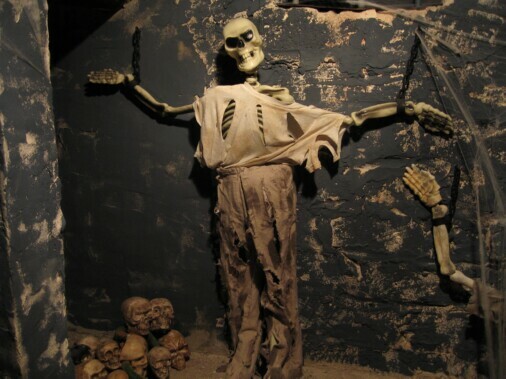 These awards offer us a chance to have our hard work viewed by everyone in our haunt community and it is simply amazing just to be able to view all the time and effort that goes into everyone's haunts and their efforts to produce a video that best features their creative master pieces for that year. 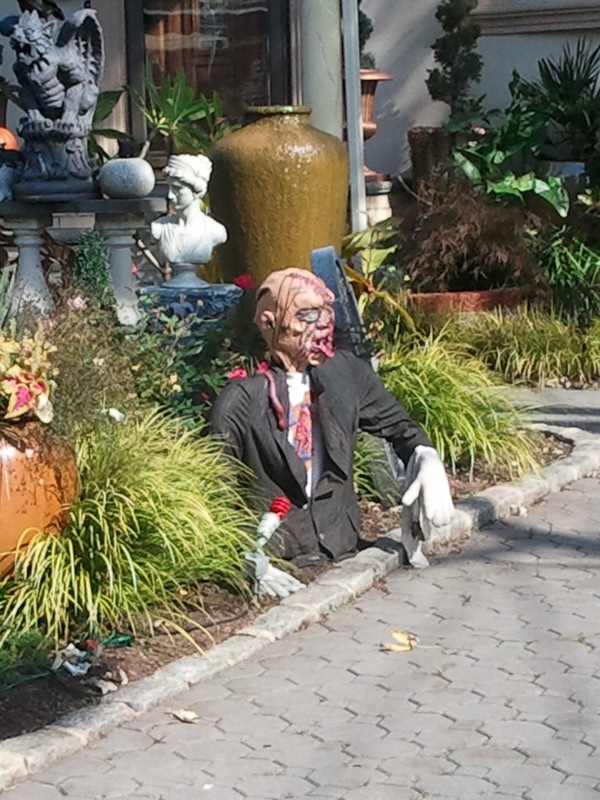 Two of the most notable contests that run every year are the Home Haunt of the Year contest provided by the Home Haunters Association. They award 3 top prizes which offer great prize packages for it's winners. 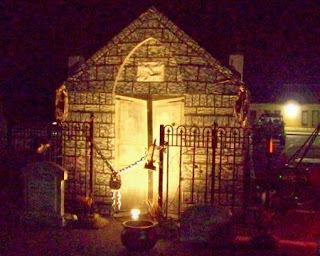 All you need to do is sign up for free on their website and register your haunt then submit your video or pictures for the judging process. The videos and pictures of all the entries are placed on the website for everyone to view which is a nice bonus and provide hours of viewing fun. The second is the Haunters Video Awards. They award prizes for 11 categories and also create a DVD Set for all it's entries. I purchased the set last year and it was amazing! 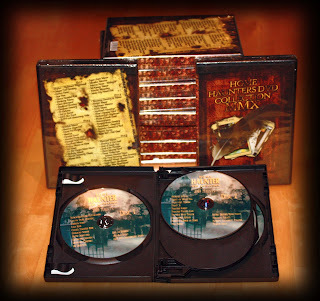 It was 5 discs full of home haunt videos from all over. 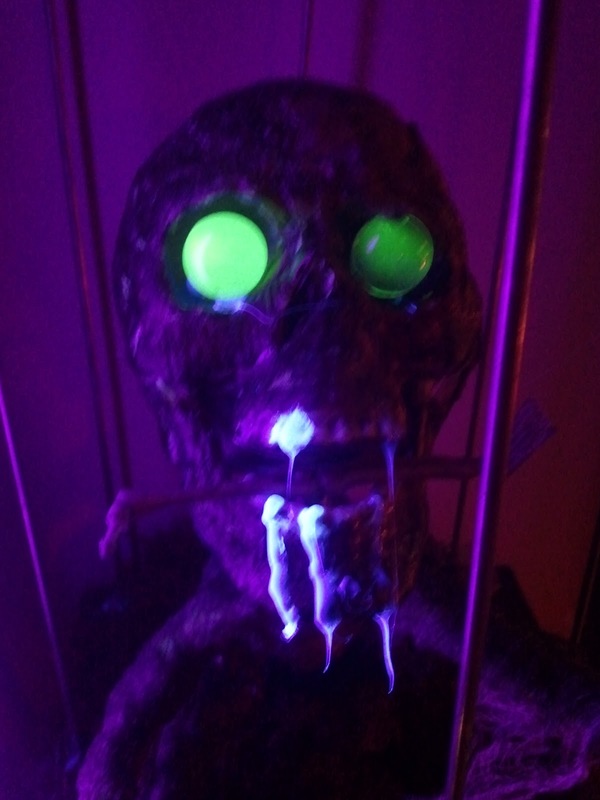 It's just great to sit back with some popcorn and experience what everyone created and it's always inspiring and gives me that continued drive to push the limits and experiment with new ideas for my haunt each and every year. 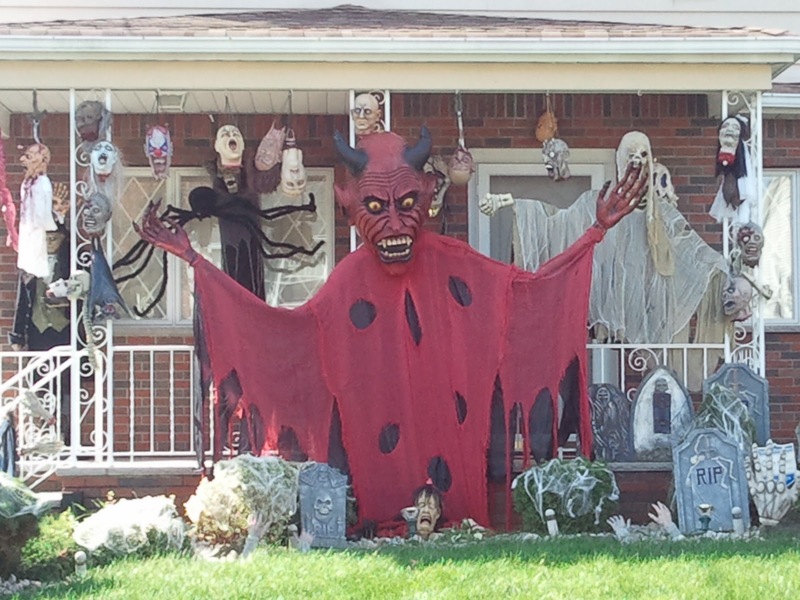 All in all, even when Halloween is over our community keeps up the Halloween spirit and shows it's support with fun contest's such as these which makes being a Home Haunter that much more special. If you have a home haunt and have never participated in either of these contest please take the time to go to their websites and watch all the past entries and hopefully be inspired to participate this year. 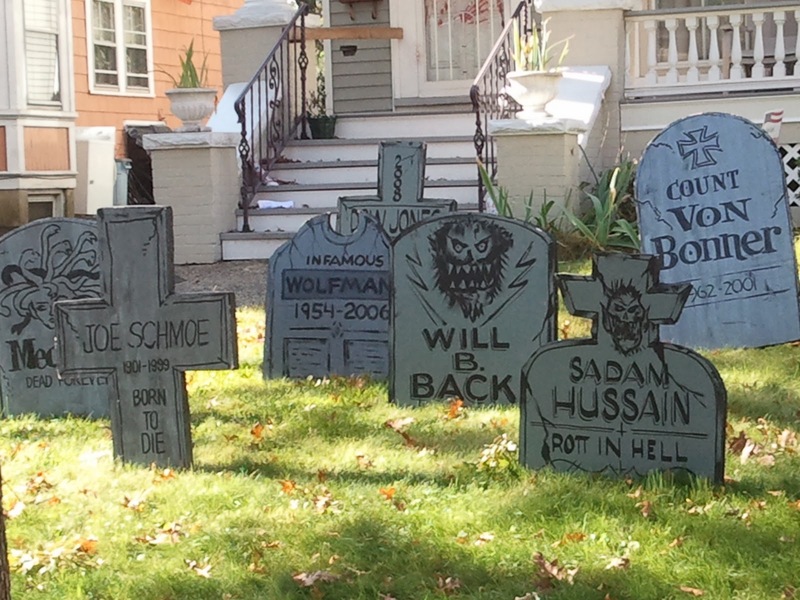 If anything it is a fun way to share your love for Halloween with everyone else. 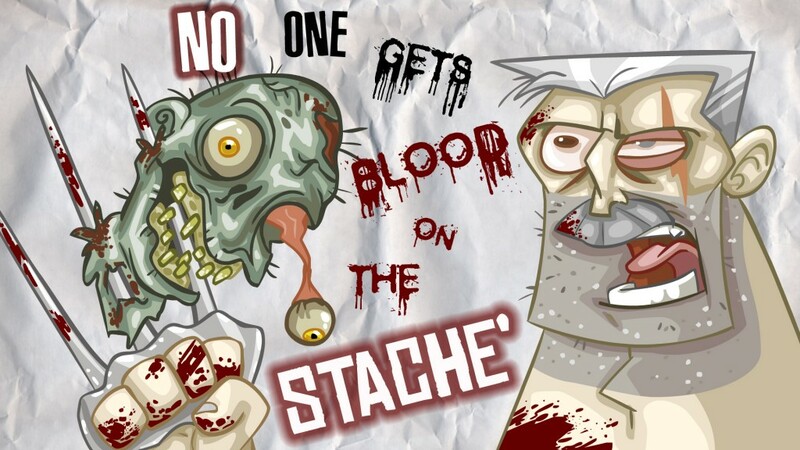 Also don't forget to check out the Halloween forums I listed above. 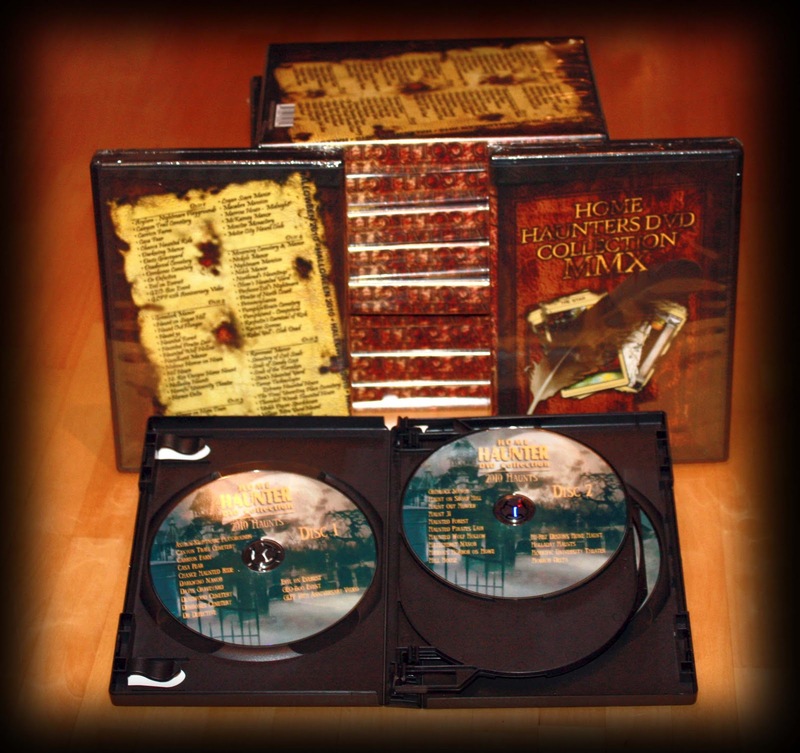 They often provide their own stand alone contests and even produce DVD Sets for their registered members as well. Now it's time to get back to work on my video for 2011. I am looking forward to sharing it with you Frightners and hope to see your pictures and videos soon! 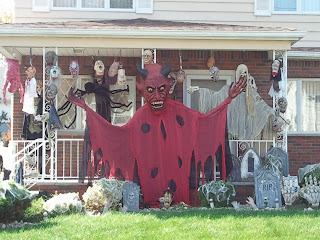 If you have any pictures and videos of this years or past years haunts that you would like to share with me or other readers of this Blog please post links in the comments section for this post as it would be great to see what you have all done! So last night we took a peek at my Madame Leota prop and tonight I would like to share with you one of my favorite prop builds of this year the Mini Minion. When I set out to create the Mini Minion I knew I wanted to sculpt something and use some various corpsing techniques but I wanted to do it on a smaller scale, I had also wanted to create a wire armature that I could twist and bend so that I could shape a dramatic pose for my tiny creature and as soon as I knew it the Mini Minion was born! This was a great learning prop for me because I have been wanting to get more into the world of sculpting and using armatures and this prop lent it self perfectly to that. I was happy with the overall look of the Minion in the end but now that Halloween is over I want to re-work some of his finishing details as well as add more detail to the cage he is held in. With this build under my belt I want to add at least two more of these guys to next years haunt which was my intent this year but time didn't allow it. It should be fun to make him some ghoulish companions in crime so keep an eye out for a Mini Minion Part 2 build coming soon! So without further adieu here is the final Mini Minion from this year. Hope you enjoy him!